Back In May, we went on holiday to Majorca, staying at the Pirates Village hotel in Santa Ponsa. The main reason we decided to visit Santa Ponsa was that we loved the look of the Pirates Village hotel, we had spent hours searching online for a small child-friendly hotel and the reviews for Pirates Village looked great so we booked back in June 2017. We had no idea what Santa Ponsa was like as we had never been before, although I have previously been to Alcudia in Majorca. Santa Ponsa is a smaller resort so I was a bit worried that there would be nothing for children to do, especially as it is fairly close to the party resort of Magaluf. 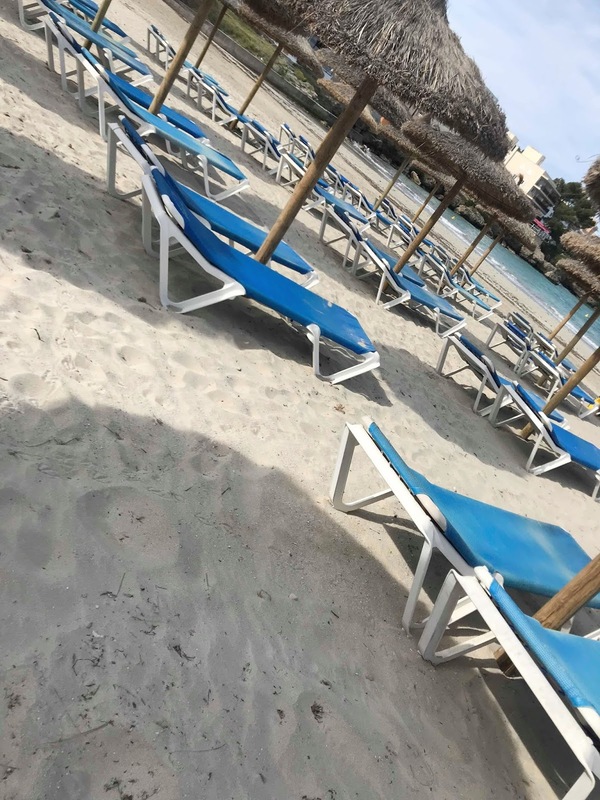 However we found Santa Ponsa to be great for a family holiday, there was a real mix of people holidaying in the resort from stag and hen parties to couples and lots of families. We spent a week exploring the resort and we found it really family-friendly with plenty to keep children and adults entertained. 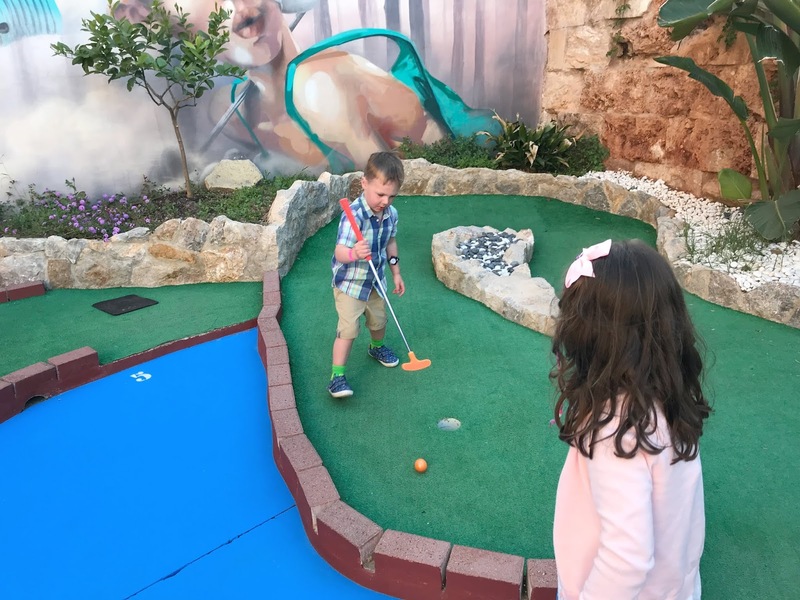 So here are some things to do with children in Santa Ponsa, Majorca. 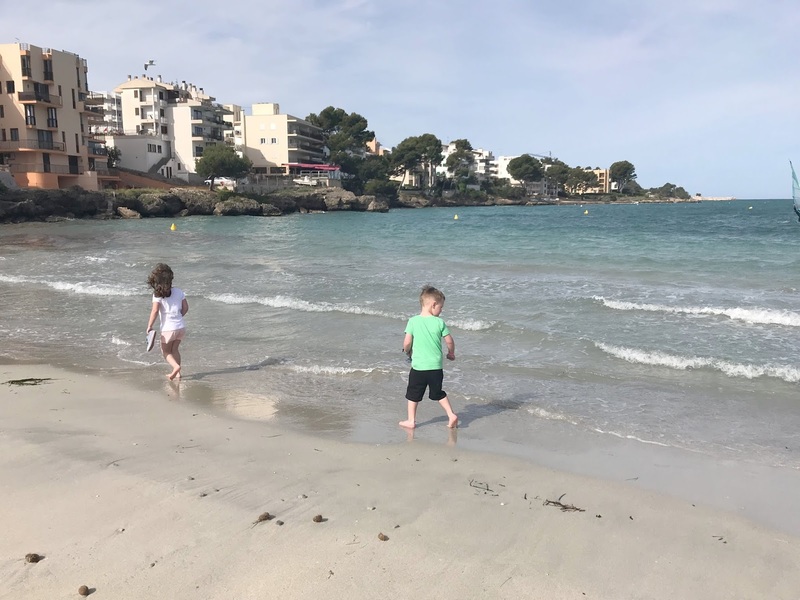 My friend Sam from Travelling With Our Kids has a great post on 5 Things To Do In Majorca With Kids if you fancy exploring the island. This is a fairly obvious point but my children adored the beach at Santa Ponsa, it is a bay so the water was nice and shallow and perfect for paddling in. The beach has lovely golden sand and it has plenty of sunbeds and umbrellas to hire (around five euro), there were lifeguards on the beach and there was always people there cleaning the beach too. They have pedalos to hire and the beach is huge meaning that there is plenty of room for everyone. We spent a couple of days at the beach playing in the sand, sunbathing and paddling in the sea. If you are lucky you might even find the little beach which is meant to be beautiful and much quieter than the main beach. There is a small mini-golf course downstairs next to Barcode 7 bar, on the strip in Santa Ponsa. We visited one night and it was such fun playing as a family, let's face it mini golf on a holiday is a must! I can't remember how much it cost but it wasn't expensive and we had a nice hour or so playing together, the children really enjoyed it - especially my little girl. They also have a small bar and some amusements so when we finished we got the children slush drinks and let them have a few games on the machines, winning grab a prize teds and playing basketball type games. We didn't get to try this out as I thought my children were too young but I would defiantly visit if we ever went back to Santa Ponsa. It is like a Go Ape type place as it is in the forest and is a high ropes course that I am sure older children will enjoy, they do have a child course for over 4s but my son was only 3 when we visited. 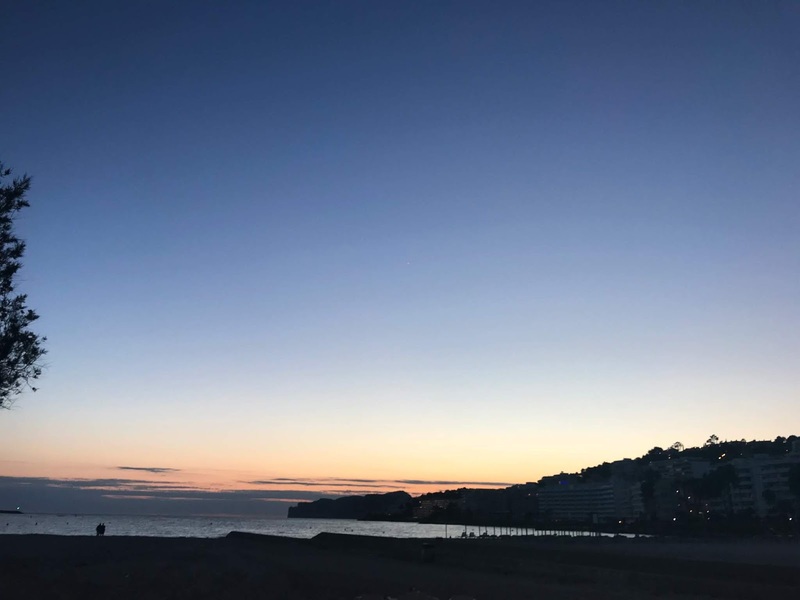 The square in Santa Ponsa is just off the strip and about a ten-minute walk from the beach, during the summer they have nightly entertainment on with different shows and it is meant to be good for children. As we visited in May this had not yet started when we visited we did visit the square which has bars, restaurants and shops, personally, I thought it looked a bit run-down but I am not sure if it was just because we visited at the start of the season or not. However, the reason I recommend the square is for the Pondstretcher shop, if you have children I highly recommend a visit to this shop. It is full of toys, jokes and gifts, it is really well priced too. The staff are super lovely and play pranks and my children adored this shop and spent most of their holiday money here. We visited twice in a week as they loved it so much. We didn't get to go on a boat when we visited as they were building a new pier but I have great things about the boat rides and is something I really want to do if we ever return. They have different trips available such as glass bottom boat trips, sunset cruises or the one we really want to do is to visit Dragon island. A four-hour trip where you get to visit a little island off the Majorca coast which is full of lizards and is something I just know my children would love. You can book the boat trips in a little shop near Coco Bay bar opposite the beach. 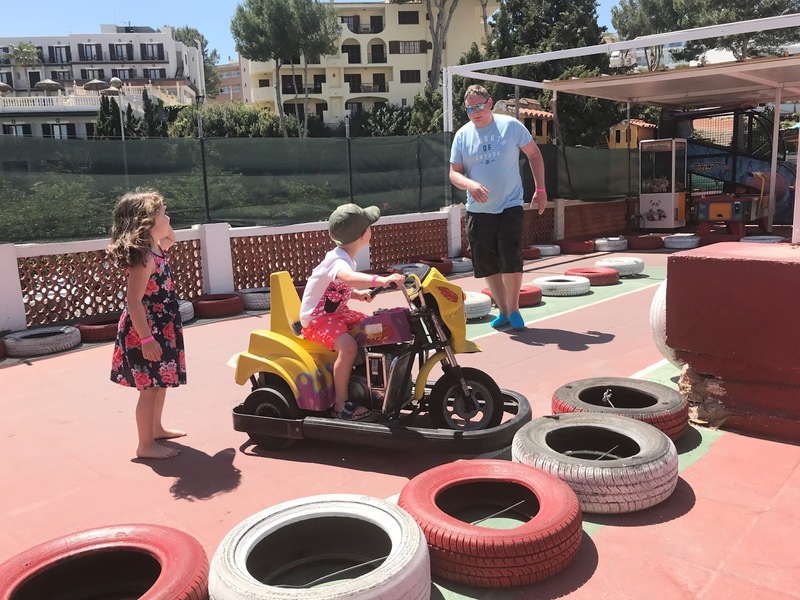 There are so many more things to do in Santa Ponsa with children, so many of the bars are child-friendly and BarCode 7 and The Scottish Corner have bouncy castles, motorbike rides etc for children to play on. Some of the restaurants overlooking the bay have supervised play areas in them and everywhere we visited the children were made to feel welcome. Another place I would recommend is Mundi Yogurt which is a little ice cream shop (on the right towards the square), they make your ice cream in front of you and serve it as curls, it was amazing to watch and only around three euro each. There is a water park, Western Waterpark which is just outside of Santa Ponsa, Near Magaluf too but we didn't visit as our hotel had slides in for the children to enjoy. 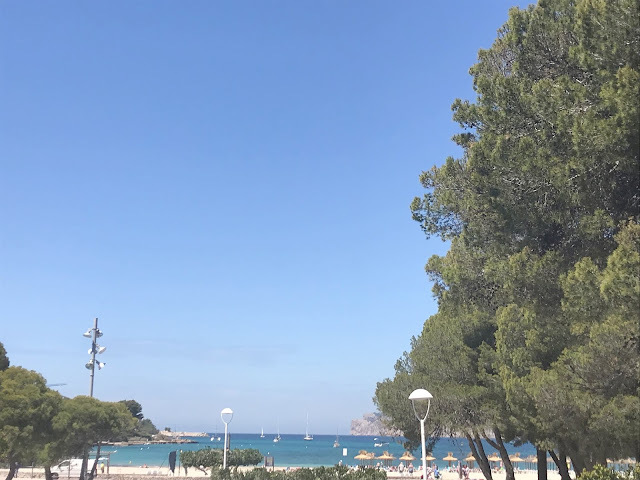 We had such a lovely week in Santa Ponsa, it was ideal for a family holiday as it is not too big so you can easily explore everything on foot. If you're feeling energetic you could even climb the 600 steps from the beach to experiences the stunning views of the bay below. 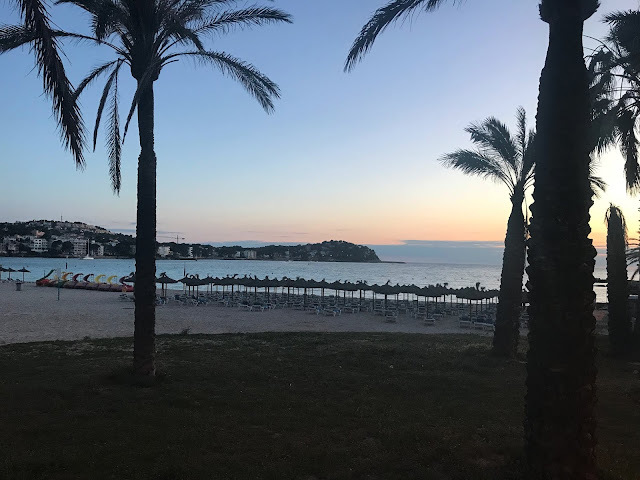 Majorca is such a beautiful island with the most breathtaking sunsets, make sure you head to the beach on an evening to see them for yourself. Have you ever been to Santa Ponsa, Majorca? If so I would love to know any hidden gems you would recommend. If you are planning a trip to Majorca with children soon be sure to check out these tips on surviving the airport with kids from The Willow Tree. My first ever holiday abroad was to Santa Ponsa 20 years ago. I was almost 20 and it was a great 2 weeks. Good to know there are family-friendly things to do there as I've got my son to consider when it comes to holidays these days! It looks a lovely place to visit and lots to do!